I hunted batteries on this 4-hour semi-urban hike, with a smaller bag than the last one, but a still respectable four AAs, along with an equal weight lead wheel balancing slug. Good thing to pick up and keep out of the waterways. I just drop the lead weight, and other steel parts I pick up, into my recycle bags, hoping the separation process treats them like steel cans, maybe with a lot of solder. The batteries I hold onto until I get a large amount, and then take them to a battery store, where once again, I hope they make it back into the raw material stream for new battery production. The first 3 were several feet apart, at the downhill side of the Middlesex shopping center parking lot, like dinosaur fossils collected at a flooded stream site. How about now? Driving at 40 MPH I never even saw the sign, and I defy anyone to know what it says without stopping and walking right up to it, which I happened to do by accident today. This RAP is based upon the potential future use of the property for residential purposes. Public Informational Meeting: April 30, 2008 at 7 p.m.
Any persons wishing to request further information or make comments regarding the proposed RAP must do so in writing. 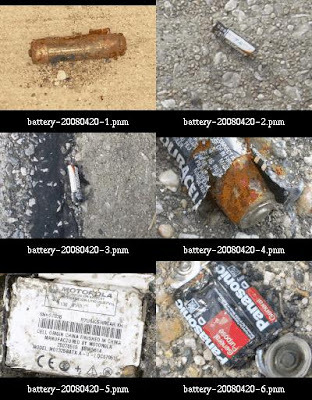 Comments or requests should be submitted to the attention of the Voluntary Cleanup Program project managers, Gary Schold or Richelle Hanson, at the Maryland Department of the Environment, 1800 Washington Boulevard, Suite 625, Baltimore, Maryland, 21230; telephone 410-537-3493. All comments and requests must be received by the Department in writing no later than May 22, 2008. Well, the meeting is only a few days away, and I already have 2 commitments, but I will pass this on (besides to my blog readers, if any). Not really much of a disclosure, but: I worked at MDE for 17 years. That was over 10 years ago now. A guy in a Cooper Mini was acting strangely at the traffic light at the end of MD 43, backing up and waving. Turns out he spotted a row of ducks crossing the busy highway, and was trying to protect them from being run over. I grabbed my camera and got 4 shots, but they were moving fast and the little ones were well camouflaged while in the tall grass. Cute once they got in the water. Thumbs up to the animal lover! 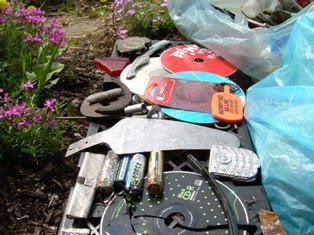 The final trash haul today, except for a gas cap that hid in my pack until later. Last night at the Creative Alliance in the old Patterson Theater on Eastern Avenue, my son and a friend won a juried film award for "Best Buddy Picture", one of 3 awards (not counting "most popular" as voted by audience majority rule) given to the 11 finalists in the 2008 CAmm College Film/Video Bake-Off contest. Besides the cool statue, they split credit for time at the Creative Alliance media cage or for classes, and each get a year's free membership. Kathy and I, as well as my mother, were just thrilled. The jury member presenting the award said they were quoting the film's dialogue for weeks afterward, after 2 screenings. Julian said it was all improv'd in 1 night. You can see it on their Facebook page, or on YouTube. 6:59 Uploaded about 4 months ago. 4 hours. 6 batteries. A good hike. 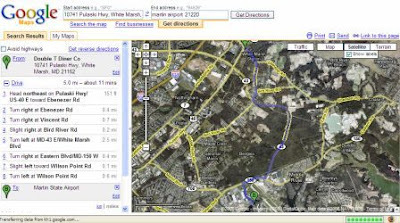 I tried to show a Google map applet of the completed route, but what was pasted into the blog page wasn't the route shown on the map. I think the code retained a bunch of waypoints I used to move the suggested driving directions to show where I actually walked. Emailed to myself, got links. Index - work in progress. Hmm. covered a lot of ground - had to adjust zoom to "4". I carted around Jay Hancock's article from the February 24 Baltimore Sunday Sun, stuck it inside my tax return folder, with a vow to look at alternate energy suppliers. BGE had put notes in the monthly bill long ago, which I promptly misfiled. It was always "later." I recalled he listed companies generating, or brokering, power from green sources, including partial or complete wind use. After seeing the Maryland legislature fumble this issue yet again (will discuss later) I decided to act instead of thinking of acting. I'll give edenbee.com partial credit here, not for their research but more for the group think/act model. Jay's site included phone numbers, but more importantly for instant gratification at 11:00 PM, web links. After checking with Kathy that the cost premium won't cause domestic turmoil, I decided to go with a familiar brand, Pepco Energy. Kathy owns less than 100 shares of that company, and they are located under 100 miles away, so I have confidence in this transaction. Links in Jay's blog (subtitled "Where to buy non-BGE and low-pollution electricity") led to a simple choice on the Pepco Energy Services site: Green or Wind. I flipped a coin and went for green. I know there are downsides to hydroelectric power, but this green also includes photovoltaics, so I went for the diversity. Here's a link to Pepco's PDF file of terms and conditions - 2 pages, 32 KB. The complete transaction to switch suppliers was possible online (hooray, no phone menu tree to navigate!) and is subject to approval still. Once I start seeing the changes in my bill I'll write it up, updating prior blogs like "electric-rates". I added a worksheet to my online home energy tracking page showing what the premium for this switch would have been on our current bill. After participating in "Dark Hour" at the end of March, I got to thinking about lighting. I have a couple books on solar energy and related topics, including a study of the Amish "Living Without Electricity" and I inherited a storm lantern from my grandfather. But I seem to have accumulated many more other portable light sources than I realized. In order to make a little visual sense out of this, I collected every flashlight and at least 1 liquid fueled lamp, ignoring candles and a few other oddities, like battery operated Christmas lights and took a few family portraits. 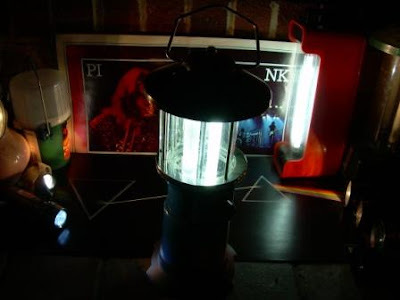 The lamp in the center is rechargeable, either through a solar panel or a 110v transformer. It includes 2 lamps - 1 fluorescent and 1 LED based. Either or both can be switched on. I've found that the LED bulb will start when the battery is weak and the other won't. However, it is difficult to read by. I've been using it for getting ready to go to work in the morning, where in the past I would have lit the bathroom, kitchen and other lights just to move around with stumbling into something. The solar panel now sits in our front window. I take it on trips with the Scout troop. The other "big" light in the picture background is a double 6-volt lantern battery with a fluorescent bulb. I have another one, not pictured, that also uses 2 6V batteries, but has 2 bulbs and switches to light 1 or both. But it isn't working. In the left side of the picture are a non-working single 6V lantern (incandescent bulb I think), and a small LED flashlight that uses 3 AAA batteries. I got this from Broad Creek Scout camp last year, and have found it much more useful than prior gifts of mugs and knives. The original batteries wore down and it now works great with 3 rechargeable NiMH ones. Also on the left side is my camping flashlight, a headband model with 3 levels of brightness. It runs off 3 NiMH batteries. Colin Fletcher's The Complete Walker advises not to get cheap versions of this style. As I've dropped mine several times, I can attest to the worth of this advice. When I first saw Scouts walking around looking like the 7 Dwarves I though it was a bit odd, but after using this in the deep dark woods I was a fast convert. On the left side of the picture are several D cell flashlight models. I have 2 dead double cell versions, and 2 working Mag Lites - one 2-D and one 3-D battery versions. They have krypton bulbs, or something like that, but I have seen LED bulbs on same at a big box store. I have a 2 AA model that I formerly used when camping, and now just take it along for backup. Will using rechargeable portable lights end our oil dependence? Probably not, but carrying a lantern that was juiced directly from the sun is a charge! I've done a 6 mile hike in about 2 hours, so I want to get a 10 miler in next. The Scout merit badge requirement for Hiking has 5 10 milers and 1 20. I did all those helping my son earn Eagle, so I need to keep in practice for the next round of those on the trail. A 10 mile hike without driving 25 miles to the MD/PA (aka Ma & Pa) railroad trail, and without using the local 2-lane roads with no shoulders, much less sidewalks? Google it. Starting point - Double T diner, is they let us use their parking lot. Ending point - MD 43 and US 1. I started with Tully's restaurant but that came out 10.6. Leaving off the stub on US 1 gave 4.8 miles one way. Probably a good starting plan. This will be the last blog on my hike on MD 43 from MD 150 to US 40, honest. I have other things to do, more hikes to plan, junk to collect, and need to move on. But I promised an art review of the hike and it's just not coming together. I used editgrid to lay out a few shots in what I think is a novel format, and then posted this page within a blogger.com page. Interesting, but not as arty as I wanted. I mapped my route with google maps and panoramio photos, and this looks okay. Here are 2 photos showing collectibles. Some consider anything collectible art, and beauty is in the eye of the beholder, and one mans trash is another mans treasure. 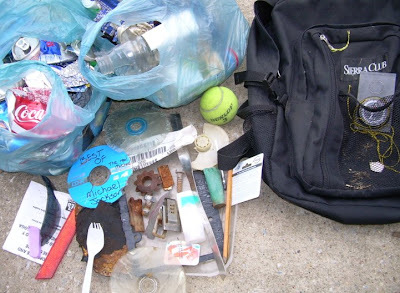 Photo 1 is everything I brought back that I didn't start with - 2 blue plastic bags with recyclables, metal, plastic, paper, and other junk. Photo 2 is a similar shot, zoomed in on the metal pieces. There were 3 CD/DVD sized plastic parts, only one of which had recognizable text other than the imprinted brand near the hub. Photo 1 shows these as 2 clear disks and 1 bluish disk. Another view of Sunday's hike. 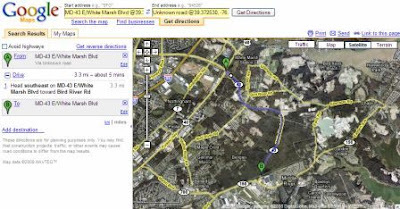 the plan was to walk on 43 from 150 to 40.
however, google earth doesn't show a road there as of April 2008.
it did let me plot the route, where I guessed the points. It showed a distance of just under 3 miles in one direction. walk, so I waited until around 2 in the afternoon. It spattered a bit as I drove to the train station parking lot but I had a rain jacket and pants so I plundered on. 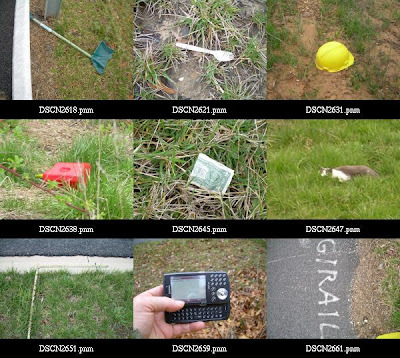 (maximum zoom, centered near Marc train station). I stopped at intersections to take shots, so I could track my progress later on the maps. The camera keeps time, and while I thought I set it, it was a few hours off, showing 10:52 when I started at 14:15. But elapsed time should work. See the index here (http://www.editgrid.com/user/jspath55/HIKE-2008-04-06), with links to the photos on their way to google earth. About an hour later I arrived at the destination. The trip back took a bit longer. Amtrak lines, showing power plant stacks on the horizon. And the Bengies Drive-In screen (120 feet wide). Finally, there's my car in the parking lot. I kept the spork, the dollar, and my phone. The rest I left. No way to carry a shovel, a helmet, a gas can or a piece of rebar. The cat lives where I saw him or her. Mapping this with google and panoramio was tricky since the photos don't show what's there now. RR tracks and roads are fine, but electric lines and streams, traditional orienteering guides, aren't that noticeable on google satellite photos. I've driven this road, so I knew where I was going, but who pays attention to sidewalk conditions at 50 MPH? Trying to figure actual walking distance, I used Google Maps to plot between 2 landmarks (Martin Airport, Double T Diner). 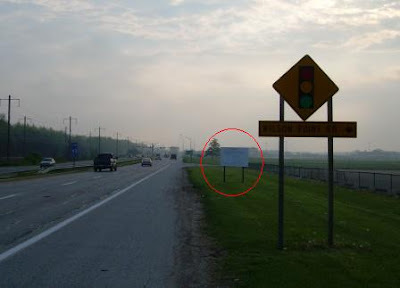 Directions said to turn from MD 43 to Bird River Road, but there is no intersection there (see photos). Filed bug with google. 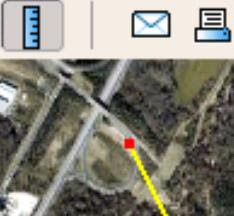 Nice to be able to push routes and waypoints around dynamically - google map says the distance is 3.3 miles each way (not counting wandering off the center line). 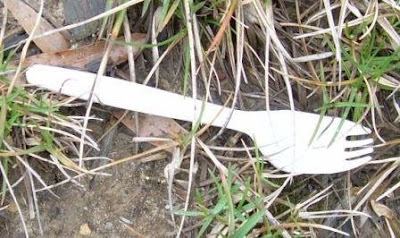 No batteries on this hike, but I found a cool spork! For those in the U.S., April can be cruel. Why? Taxes. I thought I'd get a little break for the new heat pump installed in August. After all, I went for a more efficient unit than the suggested XR13, XL14i or XL15i; I got the XL16i. Two-stage, "up to" 17.5 SEER, only the XL19i is better with 2 compressors, and SEER rating "up to" 19.5 [values from Trane brochure 72-1208-01 Sep-2005]. ... any of the following. A central air conditioner that achieves the highest efficiency tier that has been established by the Consortium of Energy Efficiency and is in effect on January 1, 2006. An electric heat pump that has a heating seasonal performance factor (HSPF) of at least 9, a seasonal energy efficiency rating (SEER) of at least 15, and an energy efficiency rating (EER) of at least 13. So I was good with the SEER rating. As far as I could tell I was good with the HSPF rating (I found 9.2 on a pro chat site - "The 16i 4TWX6036 gets 17 SEER, 9.20 HSPF but wimpy on heating at 33,200 BTU") but the EER wasn't coming up. I looked on the Trane site - no certification found. No dice, do not pass go, do not collect $300 tax credit. CEE is a nonprofit organization that works with its members in the U.S. and Canada to promote energy efficient products, technologies, and services. The certification directory is online. I have been keeping our energy usage online as a way to be transparent about my consumption. It's too high, but we're working on it. 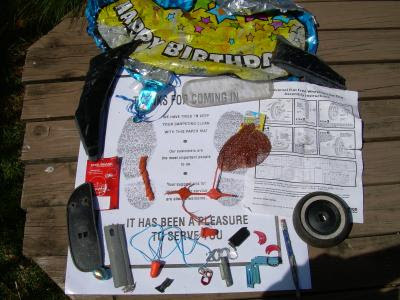 pictured: mylar balloon, car parts, plastic shreds, a wheel, wheelbarrow assembly instructions (marathon #00265), pot scrubber (chore boy/label still attached), hearing protectors, clothespin, sport helmet tag, pencil, '2006', lead weight, candy (reese's), car mat. "The waiting list is right now at ID: 8800000." Eastern Ave., Carroll Island Rd. and Eastern Blvd. This hike was drive and walk mode, so I had a central hub to dump pockets and pick up more blue bags. Found a slightly torn blue bag in the stickers between the park and the school so took that as a sign to keep picking up recyclables. Filled it to overflowing in a few minutes, so stopped except for pre-flattened aluminum cans and plastic water bottles (especially one use plastic water bottles). I was unhappy that the water fountains weren't turned on at the park, as I haven't been packing water for a short stroll near my house in early spring. "What watch?" "Ten watch" "Such watch?" Anyone who's watched (sorry) Casablanca more than a few times knows the lines in this blog's title. For the last few years, I've worn a Timex Indiglo Expedition watch for several reasons - it was cheap, it told me the day and date, it had an analog dial and a digital display, it kept time within a minute per month, and it had both glow bezels and a light-up switch. I ruined the first one on a rafting trip--water resistant isn't really what it's cracked up to be. The second one has served me well, up until this week when the battery died. I would have gone back to that big box store where a battery costs $4, except that I just did this a few months ago, so either the battery was defective or the watch is getting rusty innards. And how eco-friendly is that? I have 2 watches now that would work with a fresh battery, plus one I'm wearing that was a gift from a vendor (i.e., also cheap) until its battery gives up. The dilemma is "what watch" to get next? Clearly, I'm tired of paying $5 or so for a battery that, while small, is a challenge to recycle. A few watches at the store proclaimed "long life battery" but I'm guessing I won't be handing them (the watches, I mean--the batteries should end up recycled into new ones) down to my grandchildren, should I ever have any. What does the Internet tell me? Amazon showed me more choices than I need, as usual, but the standouts were a solar-powered model from Citizen ("Eco-Drive" - like a hybrid car dashboard clock) and self-winding models from Seiko ("Seiko 5 Automatic Mechanical self winding Date Day Stainless Steel Water Resistance Military Navy blue dial Men's Watch" - sounds very impressive). I'll visit brick/mortar stores so I don't end up with a handcuff version. The main thing I disliked about the other stalled watch I have with a mechanical day/date display is resetting the day each month with under 31 days. Daylight savings time 1-hour shifts twice per year I can handle, but forget rolling the clock back another 5 times each year. My son doesn't wear a watch, despite being given several as gifts; he says the time is on his cell phone, so why bother? Hmm.